Make Poverty History is a great campaign I have been supporting since a couple of years. With white bands as its major symbol millions of people around the world are campaigning for the Millennium Development Goals. These where signed in 2000 to eradicate extreme poverty by 2015. "Like slavery and apartheid, poverty is not natural. It is man-made, and can be overcome and eradicated by the actions of human beings." 070707 was 'half time' on the way to landmark 2015 and reports show that in some countries great has been achieved and in many others a lot more is necessary. Around the world this has been reason for another push to campaign for the universal goals against poverty. 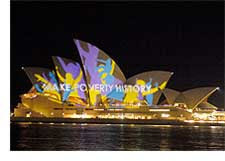 In Australia the campaign even lit up the Opera House!